Well it's been a while since we ran our little caption contest. I guess it's time we ketchup. I hope you guys relish the pic this week. See ya Saturday with the wiener, er, winner. 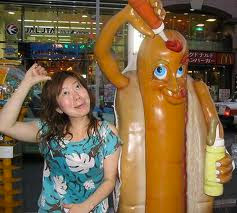 Lady, you've got the ketchup right, but you're way off with the mustard! Whoever can keep their thumb on their head the longest wins the Oscar Meyer weiner-mobile! We're the dogs kids love to bite. Originally, Kim had doubts about internet dating services but exclaimed, "Unlike the ketchup, he really knows where to put the mustard!" Oh my godess! Such a big weiner! If I were you I could be President! Margaret Cho's boyfriend, Frank, prepares to "wow" the audience with his impersonation of Mikhail Gorbachev.